Have you seen this adorably funny (pre) Super Bowl ad for Honda? Ferris Bueller, aka Matthew Broderick, has grown up and apparently moved from Chicago to Los Angeles. I love the places he visits while playing hooky from work, a la high school circa 1986. Did you notice Pacific Park, in addition to the Museum of Natural History and Chinatown? CC with Jake from Disney Junior's "Jake and the Never Land Pirates." "Yo Ho Ho" was the pirate-friendly phrase of the day on Saturday, as CC and I visited Walt Disney Studios in Burbank for a sneak peek of "Jake and the Never Land Pirates: Peter Pan Returns." CC's been in pirate mode for a while, so this was a particularly exciting adventure for my little buccaneer. 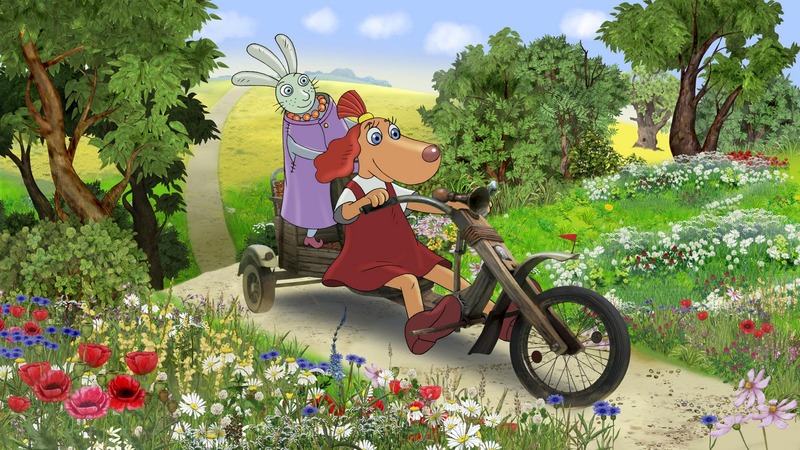 She's also a big fan of Jake and his friends, Izzy and Cubby, and loves counting all of the gold doubloons in the Disney Junior series. 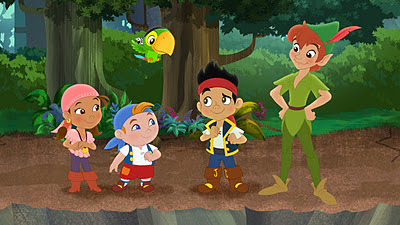 In this special primetime episode, which will air Feb. 13 at 7 p.m. ET/PT, Peter Pan (voiced by Adam Wylie) makes his first appearance with the pint-sized pirates. After losing his shadow, and then having Captain Hook capture it, Peter needs the Never Land crew's help to get it back. But, in the meantime, he teaches them some valuable lessons about thinking before you act. In addition to the adventure, kids will also be able to hear fun new songs. Just before we settled into our seats in the studio's Main Theatre, CC landed a pirate bandanna and toy sword before she rocked out on a hula hoop, thanks to Radio Disney. Along with the other kiddos in the audience, she shouted, "Arrrggh," "Yo Ho Ho" and "Me Mateys!" After the show was over, CC leaped up from her seat and started dancing. Jake definitely left my little pirate in mighty jolly spirits. Season two of the series will kick off on Feb. 20. Stay tuned for guest voices, including Sharon Osbourne, Josh Duhamel and Jane Kaczmarek. Since this seems to be the week of travel, I wanted to start off with a Friday Find that I'd like to take with me on the plane. I've heard that Klorane Dry Shampoo, which comes in aerosol or an eco-friendly spray, is great for long flights when you don't have access to, say, a shower. I don't know about you, but my hair looks insane if I don't wash it every single day. 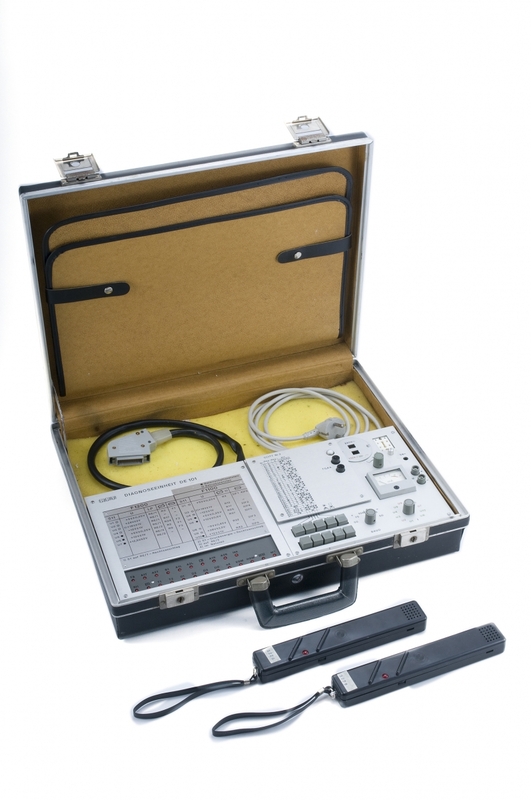 Look forward to trying this out! * Would love this book for CC. * Where did you find those Girl Scout Cookies? * Ha! What happened to the Leaning Tower of Pisa? And speaking of travel, the Los Angeles Times is hosting its annual Travel Show this weekend at the Los Angeles Convention Center. The show will feature celeb speakers, including journalist Lisa Ling, TV travel expert Rick Steves, travel guide publisher Arthur Frommer and "Man v. Food Nation" host Adam Richman, among others. In addition to speakers and panels, you'll also be able to check out the Xtreme Adventure Zone for thrill-seeking vacationers, a culinary stage and -- great for parents! -- an area called Kid's World, which will spotlight family-friendly destinations while offering hands-on activities and performances for the little ones. Open to the public on Saturday and Sunday, the Travel Show is offering tickets for $10 (adults), with kids ages 16 and younger free with a paid adult admission. 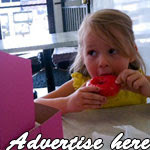 But, click here for discounted tickets priced at $8. 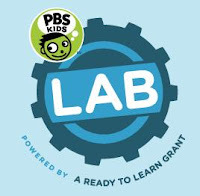 Public: Jan. 28-29; 10 a.m.-5 p.m. If you look closely around Los Angeles, you'll spot connections you otherwise might have missed. One of those -- and there are many in this town -- happens to be an L.A. tie to Germany's capital, Berlin. As I mentioned in my post yesterday, CC and I are making the voyage across the Atlantic to check out the 2012 Berlinale, and I wanted to share a few things about our own city that have bonded us to that Teutonic metropolis. 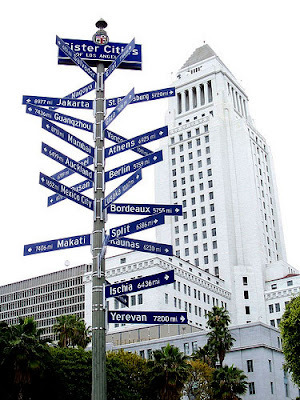 On June 27, 1967, Berlin became L.A.'s sixth sister city, and the mission, according to the Los Angeles-Berlin Sister City Committee, "was to advance the relationship in every way possible between the two prominent cities: culturally, intellectually, commercially and socially." 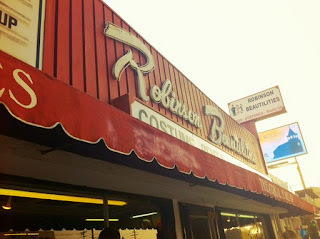 So I wanted to show you a few L.A.-Berlin spots around the city. It's by no means comprehensive, so if you have others, please let me know! And, fun fact. Did you know that there's a Los-Angeles-Platz park in Berlin? In addition to the above Sister Cities sign, located downtown's Main Street very close to City Hall, there's a more striking nod to Berlin on the Miracle Mile. 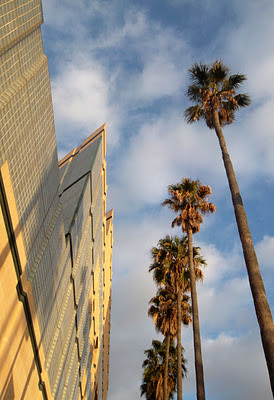 To commemorate the 20th anniversary of the fall of the Berlin Wall, The Wende Museum in Culver City partnered with the City of L.A. to erect this wall in 2009. CC and I went for a visit a few weeks after it was placed outside 5900 Wilshire Blvd. The two white sections that you see above have been painted over with images of Presidents John F. Kennedy and Ronald Reagan. 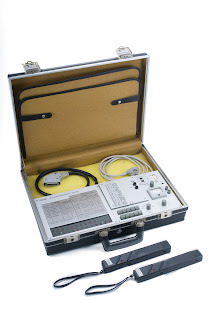 And speaking of The Wende Museum, which is tucked into a small office park off Slauson Avenue, be sure to check out its collection of Cold War artifacts, which includes artifacts such as this Stasi briefcase, which was used to listen in on private conversations in the former East Germany. Admission is free. Take the Mt. 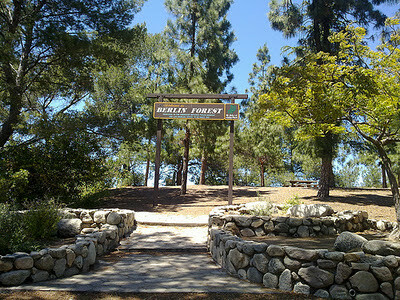 Hollywood Trail in Griffith Park to find the Berlin Forest. With pine trees planted by Berliners and visiting German dignitaries, the Berlin Forest was dedicated in 1990 and offers great views of L.A.
* And, of course, the '80s New Wave/pop group Berlin (of "Take My Breath Away" fame) was formed right here in L.A.
That's right! 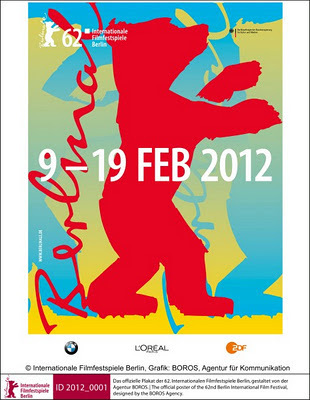 CC and I will be boarding a plane in just over two weeks to visit Berlin, Germany, and its famous international film festival, aka the Berlinale. There are also plenty of kid-friendly places to go in Berlin. There's the famous zoo, the Tiergarten, the Brandenburg Gate, the German Museum of Technology (among tons of other cool museums) and, of course, the (in)famous Berlin Wall. "Lotte and the Moonstone Secret" will screen at the 2012 Berlinale. So, why Berlin, you might ask? First off, did you know that Berlin is a sister city to Los Angeles? I'll be posting this week about fun Berlin-related spots around the city. But I also have a more personal connection to the city -- well, more like the country in general. One of my college majors, in addition to English, was German Studies. I lived for a year in Hamburg, visiting Berlin several times while I was there. And I helped cover the 2008 Berlinale when I was at Variety. Of course, I wish Ian could go with us, but sadly his back is preventing that this time. That just means we'll have to plan more trips for the future! I'll be checking in with updates while I'm there, too, so stay tuned! 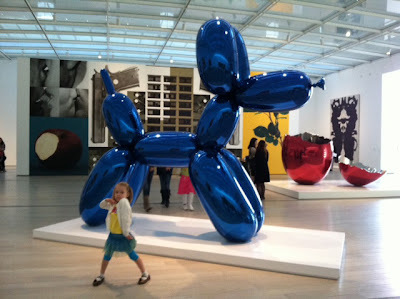 CC poses in front of Jeff Koons' "Balloon Dog (Blue)" at LACMA. This has definitely been a very art-friendly week. First, Royal/T, then LACMA. 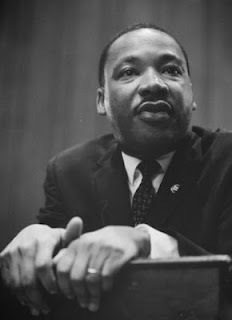 As I mentioned in my MLK Jr. post, the Los Angeles County Museum of Art offered free admission on Monday, which meant a fun field trip to the Miracle Mile. 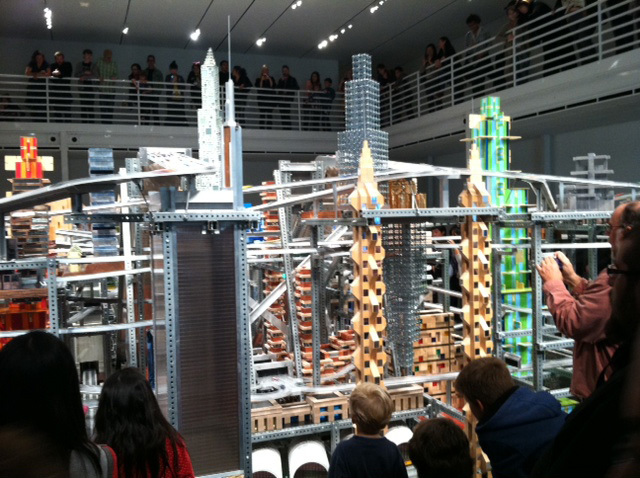 In addition to eyeing pop art, a la Jeff Koons (above) and Andy Warhol, we also caught the new "Metropolis II" exhibit by artist Chris Burden (where we also spotted a museum-going Owen Wilson). CC and Ian loved it. I did, too. There was so much energy in the room, which housed the mini urban landscape, complete with zooming cars, tall buildings, bridges and freeways. LACMA visitors were crowded around the exhibit, as well as above it on a second-story landing. A couple of times, CC even tried to blend in with the exhibit herself, inching her way closer and testing the strength of the protective wire rope. 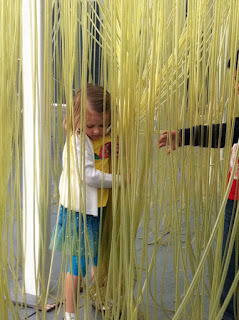 My little explorer also enjoyed the outdoor "Yellow Tubes" exhibit from Jesus Rafael Soto. 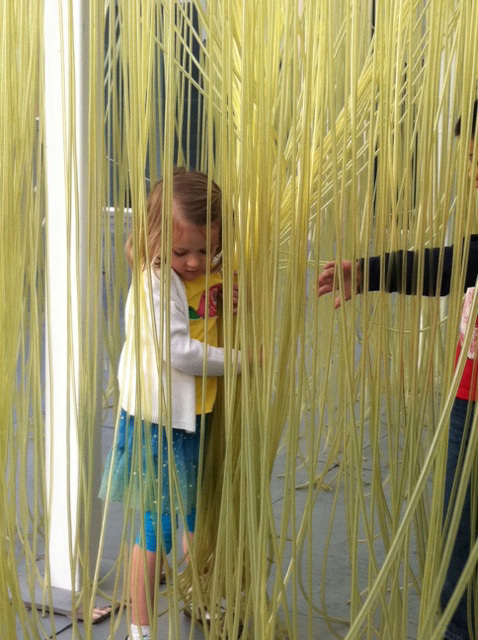 Kids of all ages wound their way through the long, hair-like tubes. 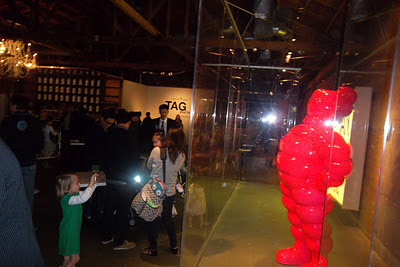 It reminded me a little of this former LACMA exhibit. We were able to tour so much of the museum, adding Ai Weiwei sculptures, live music and "California Design, 1930-1965: 'Living in a Modern Way'" to our art-loving day. Not only that, but I also captured this awesomely (if I do say so myself) SoCal shot on our way back to the car. Very inspiring, indeed. Looking up at LACMA from Wilshire Boulevard. Design Mom, one of my most favorite blogs on the Web, asked yours truly to contribute my thoughts about 2012 New Year's resolutions. 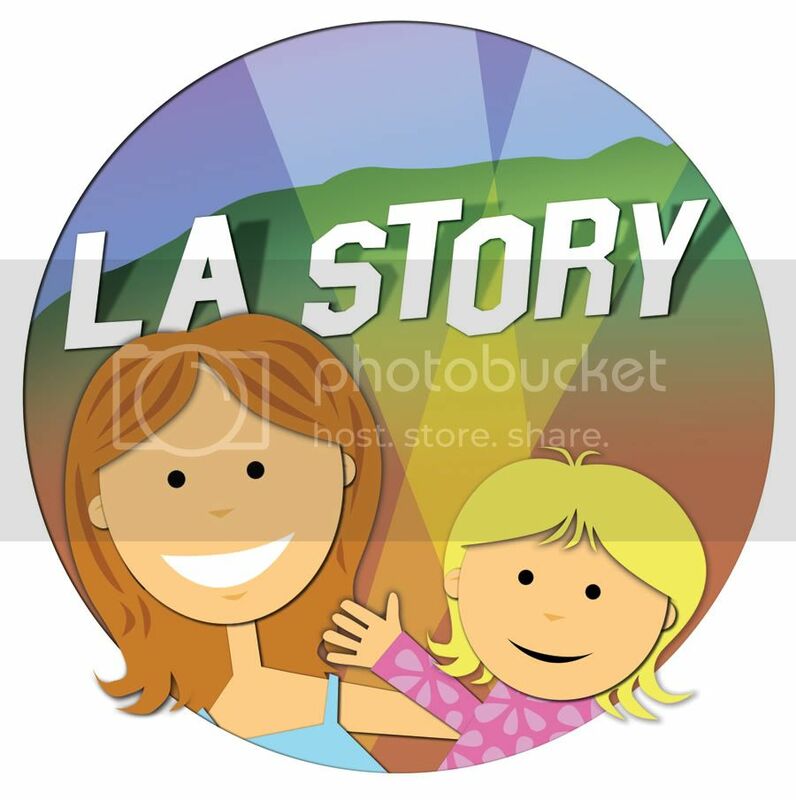 Click here for the answers, including one from L.A. Story. I was so excited when Gabrielle asked me to participate. If you haven't yet checked out her blog, please do. 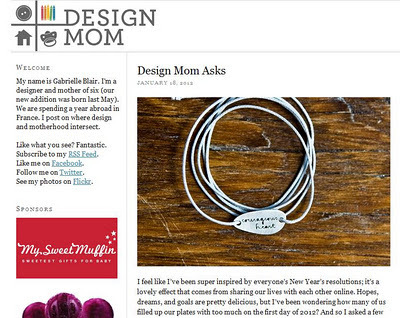 Not only is she a mom to six lovely kiddos, she's also the co-founder of femme-community site Kirtsy. Gabrielle and her husband, Ben Blair, also moved to the Normandy region of France last year, which sounds like an amazing family adventure. Thanks again, Gabrielle, and Happy New Year! What have you decided on for your New Year's resolutions? 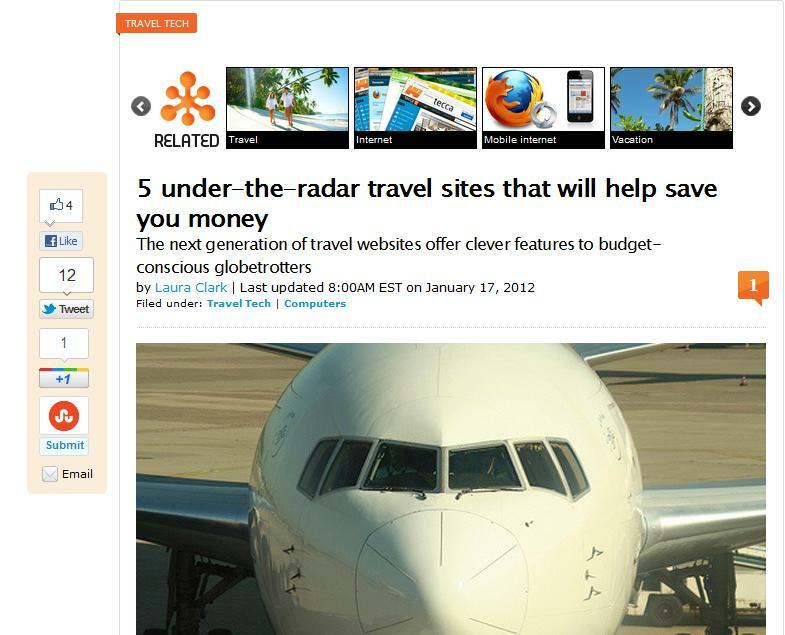 Please check out my latest story on Tecca.com, "5 Under-the-Radar Travel Sites That Will Help Save You Money." 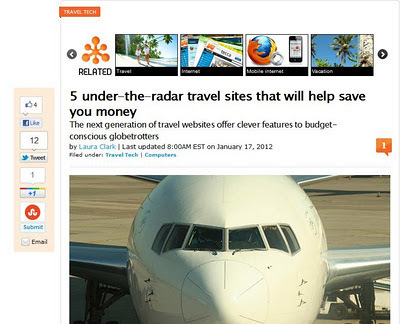 If you're thinking about planning a Spring Break vacation with the kiddos, check out these sites -- which offer cool features that you might not find on their big-name rivals. "TAG, You're It," the new exhibit at art space/cafe/shop Royal/T curated by Amber Nolan, is a wonder for the pint-sized set. 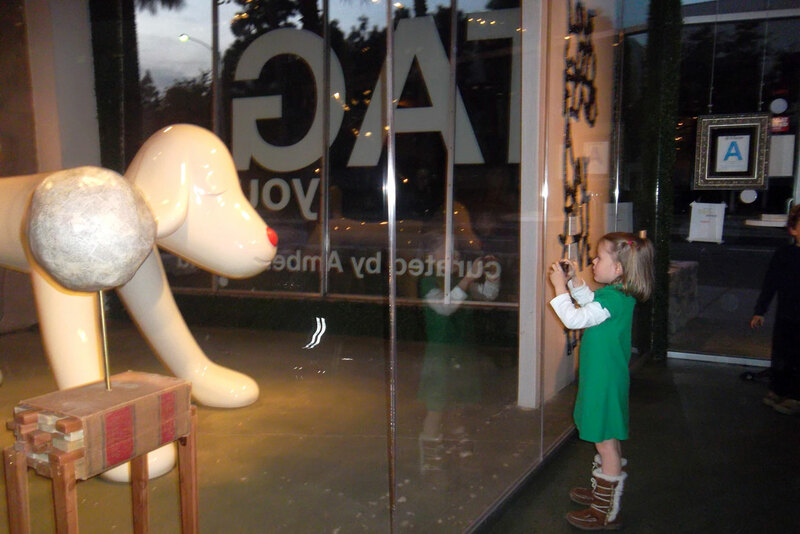 Created with tykes in mind, Nolan wanted to inspire the next generation of art lovers with pieces including a giant red robot, an equally out-sized puppy dog and a mesmerizing short film of a dandelion blowing away in the wind (by John Carpenter). She was even thoughtful enough to hang the art a little lower for the little ones. CC snaps a pic of "Your Dog" by Yoshitomo Nara. 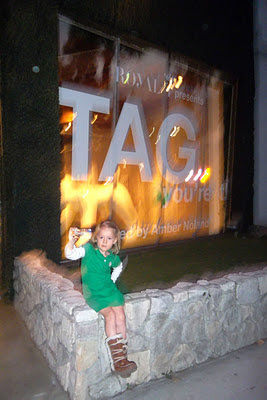 We visited on opening night, and the exhibit is fun, exciting and an attention-getter for kids (and adults, too!) In fact, CC asked for my camera so she could take a few pics of her own. 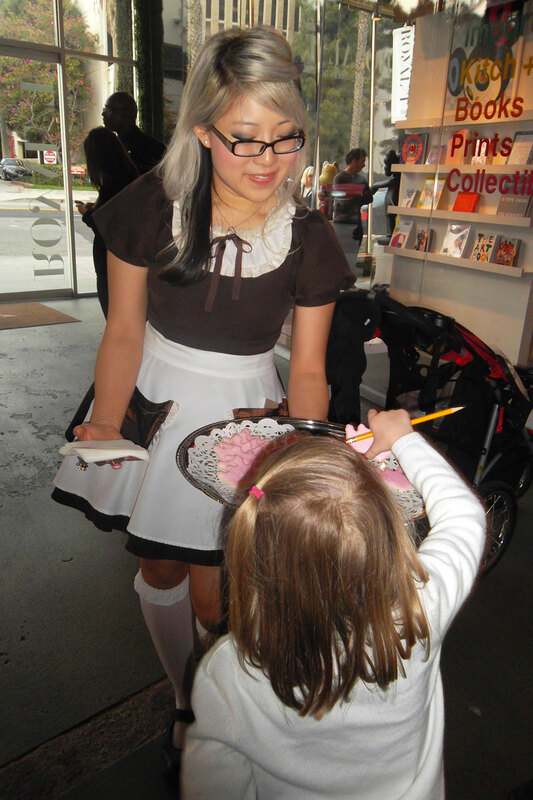 You can also stay and grab some eats from the Japanese-style cosplay ("costume play") cafe. CC snagged a couple of crown cookies from the playfully outfitted waitresses. The free exhibit runs through March 25. CC keeps an eye out for whales in Dana Point. On an intermittently rainy Sunday afternoon, CC and I drove down to Dana Point in Orange County to see if we could spot a whale or two. Our boat, the Dana Pride. According to the Dana Wharf brochure, "thousands of California Gray Whales leave the cold Arctic Seas and follow the coast line to the warm, calm waters of Southern California and Baja. This 10,000 mile round trip migration brings the majority of the Gray Whale population past Dana Point ..." Which is why founder Don Hansen launched the company in 1971. Once I boarded the Dana Pride, I was honestly so taken with the beauty of the water, the coast and the sun peeking out from behind the cloudy sky that I didn't care if I saw any kind of sea-faring creature. That would be icing on the frosty January cake. 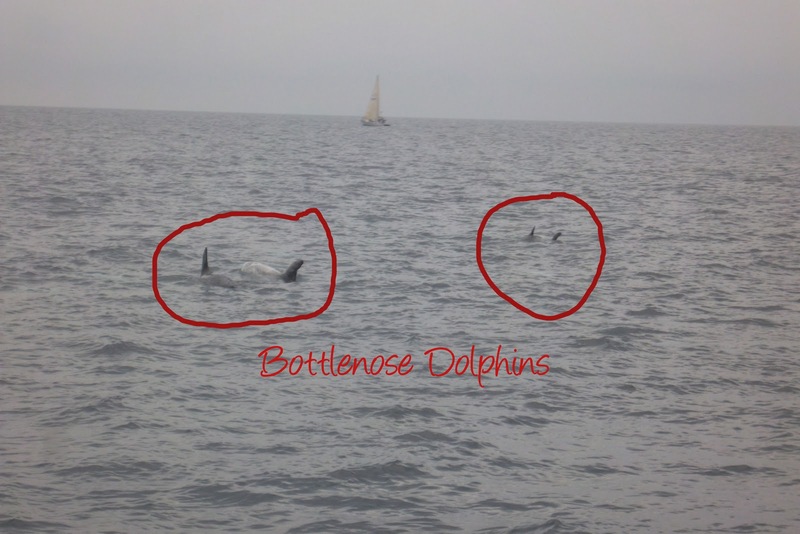 We did end up seeing lots of what are called common dolphins -- which exist all over the world -- as well as larger bottlenose dolphins. They were all so cute, swimming within about 10-15 feet of the boat. It was amazing, watching as they leaped out of the water, swam in groups of three or four, and seemed to follow us on our coastal journey. Unfortunately, my camera wasn't quick enough to catch them jumping out of the water. We also caught several lazy sea lions, catching some shut-eye on a large buoy. While we didn't get to see any whales this time, CC and I so enjoyed the two-hour trip. There's plenty of room to walk around on deck, and there's also a galley downstairs in case you need a bite to eat or drink. It was also CC's first time on a boat, and I was happy to see that she definitely has her sea legs. In honor of Martin Luther King Jr. Day, a couple of Los Angeles museums are celebrating in their own way. Have a wonderful, restful day. The famous blue-and-yellow tent, aka The Grand Chapiteau, has once again been raised at the Santa Monica Pier, this time ahead of Cirque du Soleil's show, "OVO." Opening Jan. 20 right next to the ocean, "OVO" tells the story of a vibrant ecosystem that can be seen from a bug's-eye view. Big, bright and beautiful costumes (did you check out the above pic?) will share the spotlight with Cirque's trademark acrobats and other performers. A mysterious egg will also come into play, along with a love connection between an awkward bug and a colorful ladybug with personality. The last time CC and I watched Cirque under the Grand Chapiteau, it was truly magical -- especially next to crashing waves in the foggy night air. It made me think about what a great learning opportunity it is for her -- especially since we focus so much on reading and writing. So it was perfect timing last week, when I learned about the PBS Kids Lab, which aims to make math "more approachable for parents and fun for kids." In addition to offering helpful online content -- with Spanish translations -- the site provides great tips for parents who are looking for ways to add math into everyday activities like car rides. 1. When driving in the car, count the number of trees as you pass by. 2. Call out street signs, and identify their shapes. 3. Count aloud the seconds it takes for a child to brush his/her teeth. 4. Cook with the kids, and count ingredients. 5. Play grocery store with household items, and count out the change. What do you do to help make math fun for the kiddos? CC dons some cool shades at Robinson Beautilities in Mar Vista. There are still some stretches of Los Angeles that look as if they're stuck in 1962 or '42 -- in a good way. The signs are uber-vintage, with siding facades and neon-rimmed letters. On Venice Boulevard in Mar Vista, you'll run into that a lot. One shop we visited this past weekend was costume and make-up shop Robinson Beautilities. Crazy name, right? Ian had visited before -- to purchase a mullet wig, no less -- and wanted to introduce it to CC. Like father, like daughter -- she loved it. She tried on crazy sunglasses, a pink wig, played a little Skee Ball and rode a 25 cent train. While the exterior looks as if it's been around since before poodle skirts were the Next Big Thing, the website says that the props part of the store has been there since 2001. Hmm. I think I'll have to investigate. CC decorates her dragon streamer at the Oshogatsu Family Festival. The Year of the Dragon officially kicks off on Jan. 23, but yesterday CC spent the afternoon at the Japanese American National Museum making a couple dragons of her own. The museum in Little Tokyo was packed with families, as everyone joined in the fun celebrating the Oshogatsu Family Festival -- which celebrates the Japanese New Year (every Jan. 1). While there was lots for kiddos to do, including origami, noodle-making and dragon-building, CC gravitated toward making dragon streamers and dragon hats. And, oh yeah, the dragon bounce house! CC with her streamer and dragon hat -- all in various shades of pink! We also caught a "performance" from candy artists, who turned liquid sweets into dragon and panda creations. That was pretty amazing, although I think CC was tempted to just grab the panda and start eating. CC watches as a candy artist makes a sweet panda. Yesterday -- a breezy SoCal Sunday in early January -- was gorgeous. The sun was out, the cool air was refreshing, and the afternoon was perfect for exploring L.A. with the kiddo. P.S. Stay tuned for the Golden Dragon Festival and Parade in Chinatown Jan. 28-29! 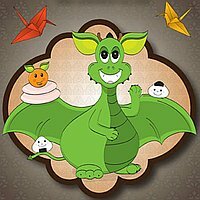 The New Year might have just arrived, but the Year of the Dragon is almost upon us, and the Japanese American National Museum is celebrating the occasion with a free event, the Oshogatsu Family Festival, on Sunday, Jan. 8. The all-day extravaganza will feature arts and crafts -- kids can make origami dragons -- as well as food and live performances. Kids will be able to make onigiri rice balls, jump in a dragon bouncer, watch as a candy artist sculpts dragons out of sweets and catch Shi shi mai (traditional lion dance) and taiko drum performances. CC and I visited the museum almost two years ago, and she had such a wonderful time making sock puppets. I think we'll have to stop by again! Sunday, Jan. 8; 11 a.m.-5 p.m.
CC's godparents came back from New York with a terrific Christmas present for our little craft-loving girl. 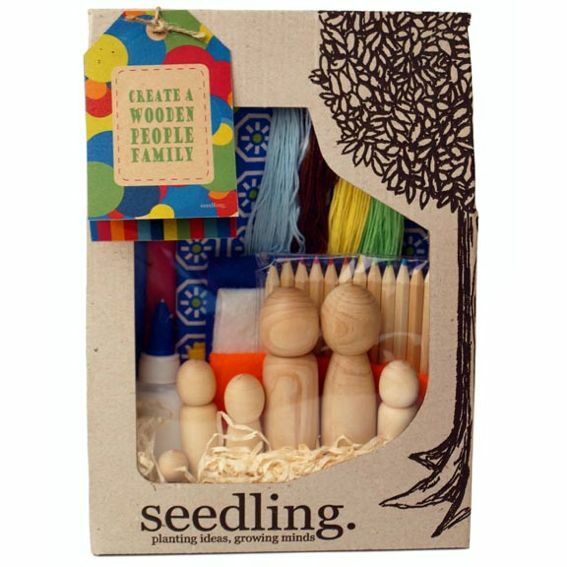 In a cute Brooklyn toy shop called Acorn, they found a make-your-own wooden family kit from seedling. -- a New Zealand-based toy company. When she saw the wrapped present on the table after preschool, CC tore right into it and started crafting. She loved the colorful felt and fabric squares, the wooden pencils and the multi-colored thread. The package even comes with a little bottle of glue. How convenient! After CC decided she would make a little girl (of course!) and I would make a mommy (of course, times two! ), she chose the hair color, dress style and drew a little face. While this project is geared toward kids ages 4 and older, it's still helpful if parents are there to make sure everything is glued and cut properly. CC chose the red hair, and the polka-dot dress over the yellow felt shirt. 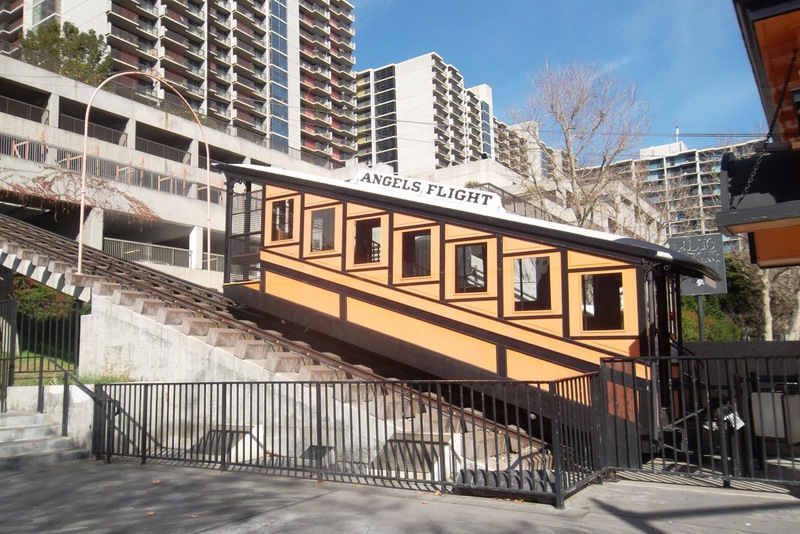 On Dec. 31, 2011, Angels Flight Railway -- the shortest railway in the world, located in downtown Los Angeles -- celebrated its 110th birthday. 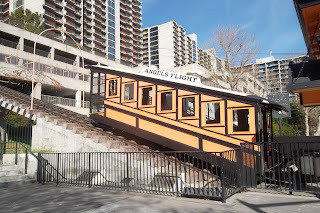 The little 298-foot funicular, which was built in 1901 to transport wealthy Angelenos up and down Bunker Hill, is only 25 cents for a one-way ride. (There are two orange cars, named Olivet and Sinai.) We didn't make it downtown for the railway's actual birthday, but my pal Mike, who blogs at Franklin Avenue, visited with his son, and rides were just a penny. So yesterday, as a kind of last hurrah before preschool started again, I took my little angel downtown for a round-trip flight of her own. 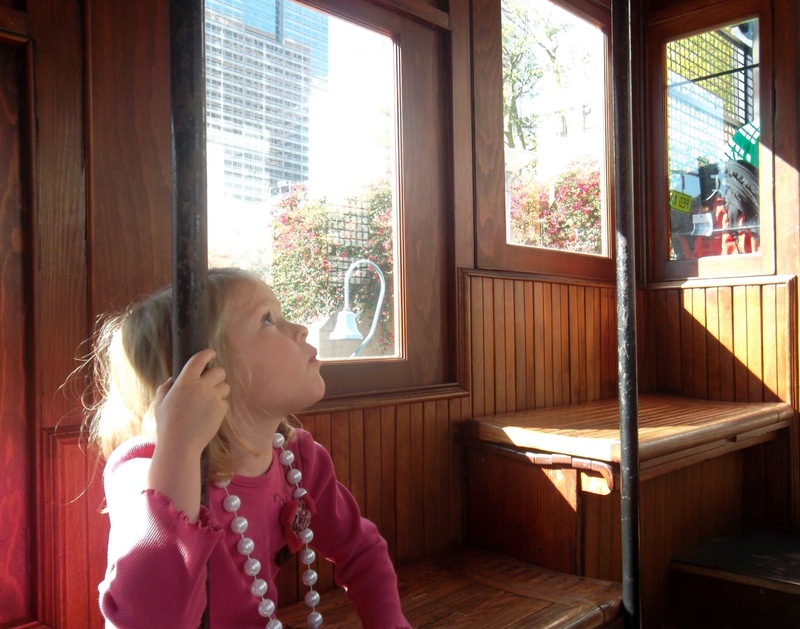 CC checks out Angels Flight. After going up and down the railway, we headed across the street to Grand Central Market and grabbed lunch at one of the booths, MF Gourmet, which adds a bit of hipster splash to the historic market. What a great way to kick off 2012 in the City of Angels! 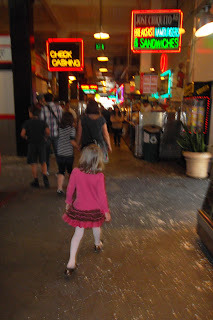 But this time, when one of her friends invited us to the Pier for a play date, the girls made a beeline for it. It's called the Euro Bungee ($5), and CC went crazy for it. First, kids hop on a scale, which determines how many bungee cords will be attached to the child. They are then strapped into a belt and hooked up to the cords. After being schooled on the rules (no flips! ), the kids can jump as high as they can, aided by a staff member who's in charge of the hydraulics. What a thrill for CC! 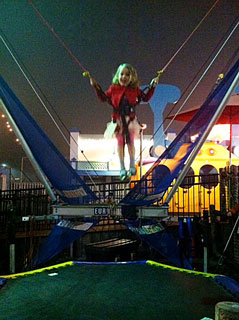 She was leaping high in the air -- easily 10 feet -- and was laughing and giggling the whole time. Same for her friends. The other moms and I talked about how we'd lost our thrill-seeking ride mojo after having kids. Does that happen for everyone? Happy 2012! Last night, we spent the evening blowing up balloons, wearing party hats and taking lots of fun pictures.